The Organization has been successful in delivering several data conversion & recovery solutions. The below discusses about the DBX file supported by the DBX. It further defines the methods to transfer DBX data (DBX file) to PST supported file formats PST, EML, and MSG using DBX to PST Converter. Outlook Express is an email and news client that was a part of earlier Windows versions and was lastlyavailable on Windows XP supporting DBX file format. MS PST is updated email client used by several organizations with inbuilt MS Office applications. Though both the email clients are from Microsoft, it support different file types making it difficult to use DBX file in PST and vice versa. The article will be discussing on can we transfer DBX data to PST data files. The DBX file is the storage file used by the outdated Email client, Outlook Express and it supports only 2 GB file size and it is likely to be crashed when the file size exceeds or reaches the limit. The old DBX files created from Outlook Express earlier needs to be converted to newer file format in order to make it usable in PST. 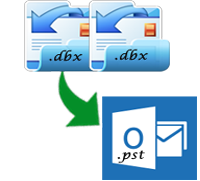 Manual Method :- The only manual method for transferring DBX data to PST is by using Windows Live Mail. We can use Windows Live mail to import the emails from Outlook Express to Windows Live and then export mails to MS Exchange making it usable in PST. This method may be difficult for non-technical users andhas risk of losing email data. Third Party Tool :- Since manual method does not give satisfactory results, the third party tool like DBX to PST Converter can be used for multiple Outlook Express DBX files to Outlook PST, EML, or MSG files without having to install Outlook. The software allows export of selective files or folders keeping the format of email items intact. There are two options to add DBX file - either add multiple files individually or add folder containing all DBX files.